Water, an essential element for life, plays a significant role in the religious culture of people around the world. For example, water in certain rivers and wells is believed to have curative properties. Water is used for purification and has mysteriously gushed up from where a spiritual person has thrust a staff on the ground. 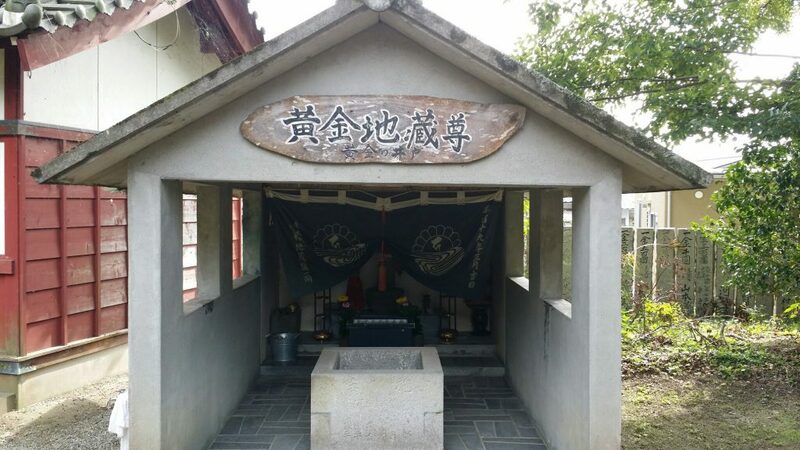 The close relationship between water and the people on the island of Shikoku is no different and so, I would like to describe some well-known and lesser-known stories related to water along the Shikoku Pilgrimage route. Upon entering the grounds of any sacred site, whether it be a temple or shrine, you will notice that there is a basin to use to wash one’s hands and cleanse one’s mouth as a symbol of purification before worshipping. Then, a pilgrim with a wish in mind might use a ladle to splash water on a statue on the temple grounds as an offering and as a hope that the wish might come true. Or in the case of a Mizumuke Jizō (water covered Jizō: 水向地蔵), people make offerings and throw water at the Jizō statue to pray for someone who has died. At Temple 34, Tanema-ji (種間寺) there are many bottomless wooden ladles hanging in the Kannon hall (観音堂). They are from pregnant woman who brought them to the temple where the priest knocked the bottom out of it so that it cannot hold water. This is to signify their hope that the baby will come out as smoothly as water passes through the bottomless ladle. The priest prays for two nights and three days for a safe childbirth and returns the ladle. Then when the child is born, the mother gives the ladle back to the temple. Other people who wish that an illness would go away, will go in search of water that might cure them. One place to get such water is Temple 17, Ido-ji (The temple of the well: 井戸寺) in Tokushima where it is believed that Kōbō Daishi solved the water shortage in the area by digging a well in only one night with his staff. Not only is drinking the water said to have medical powers (you can take some home in a small bottle for 100 yen), but if you can see your reflection in the well then misfortune will not come upon you. If you cannot see your reflection then something bad will happen to you within three years. The same thing is said for the well at Temple 3, Konsen-ji (Temple of the Golden Well: 金泉寺) also said to have been dug by Kōbō Daishi. Further along the pilgrimage route, you can also buy sacred water at Temple 22, Byōdō-ji (平等寺), at another yet well dug by Kōbō Daishi, but this time the container will cost you 200 yen. There are also stories of people who prayed to Kōbō Daishi and asked that their fields become fertile. 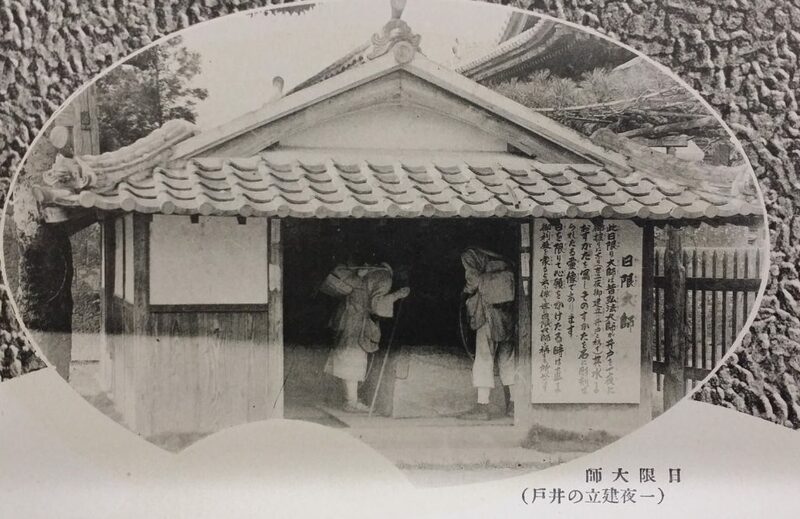 For example, in the spring of 1808, there was a man called Kumakichi who lived in the village of Nishibun in the district of Itano in Tokushima prefecture. He always had faith in Kōbō Daishi. The fields that he owned received too much sunshine so they could not be used as a rice field and were too damp to be used as a vegetable plot, so with each year, the lot worsened. One evening a priest appeared in his dreams and said, “Place a rope around the four sides of your land and dig a well in the middle. If you do so, water will come up and make your land fertile.” He quickly awoke, expressed thanks in his mind that Kōbō Daishi had given him such instruction, and hired people to dig a well in the middle. However, he had to suddenly leave on official business to the castle town. People gathered and did not know the reason for digging the well in the middle of the rice field. Not wanting to disrupt the flow of harvesting, they dug the well a little to the side. However, no water came up. While they were deciding what to do, Kumakichi returned and said, “No! No! You’ve made a mistake! I asked you to dig right in the middle of the field, but you have done it to the side. Quickly, dig in the middle!” The people did so and strangely well water emerged. As a result, not only the owner of this land but also his neighbours benefited from this water. Farmers in Tokushima are fortunate because they have the large Yoshinogawa River to use for irrigation, yet those in Kagawa prefecture have had to build reservoirs to store rainfall because of the lack of rivers. In fact, Kōbō Daishi was asked to come back to Kagawa from Kyoto in order to supervise the construction of a dam for the reservoir in Mannō-town, an endeavour which had not been successfully completed. It was a huge project but completed in only a few months due to the charisma and leadership of Kōbō Daishi and the overwhelming strong support of the people in the area. In fact, according to a recent TV program where a group of engineers calculated how much earth had to be moved into place to form the dam, they declared that the number of people to needed to do the work in such a short period of time far exceeded the population in the immediate area. You can read more about the history of Mannoike Reservoir in this brochure. Life would not be possible without water, yet in our modern day, we seem to take it for granted. Next time you visit Shikoku, look for and learn more about the stories related to water, giving thanks for its existence. This article was first published in the February 2015 issue of Awa Life.